We are very excited to announce the Educational Bridge Project’s 30th Annual Russian-American Festival, Days of Russian Culture in America, which will run from October 17 to November 4, 2016. As usual, the Festival will feature musicians and lecturers from prestigious Russian and American cultural and educational institutions. New this year, the festival will have on its schedule several “Immersion Programs” that will be unlike anything we have done before. These immersion programs will give our participants from Moscow and St. Petersburg an opportunity to participate first-hand in an American educational experience. Here is one example of how this will work: Alexander Kushnarev, a French Horn third-year student from the Moscow Tchaikovsky Conservatory, will meet Megan Shusta, his counterpart from the New England Conservatory, soon after his arrival at Logan airport. They will work together on preparing Beethoven’s Sextet for Two French Horns and String Quartet, Op. 81 bis, for a concert at the St. Botolph Club on Tuesday, November 1, 6:30 p.m. This much is typical of past Educational Bridge Project Programs. However, in addition to rehearsals and comparing notes (literally), Alexander will also attend the same classes that Megan is taking at NEC this semester. He will go with her to orchestra rehearsals, to her chamber music class, to her music history class, and to her music theory class. It is our hope and expectation that Alexander will share the benefits of his experience and insights with his friends and classmates back in Moscow after this week is over. We also hope that Megan will participate in our next festival in Moscow in May 2017 and will meet with Alexander again – this time on Bolshaya Nikitskaya,13, not far from the Kremlin, in the French Horn class of Professor Vladimir Shish. Musicians are fortunate – even if we don’t know one another’s languages, we still can communicate through music. After several hours of rehearsals, even without speaking a word of Russian or English, Megan and Alexander can nevertheless understand each other as performers and come to an agreement on how to play this very challenging Beethoven piece together. In building such educational bridges, we gain insight, earn respect, and form both an abiding appreciation for one another and enduring friendships. The festival schedule will have more traditional events – concerts of violinist Alexey Osipov and pianist Oxana Shevchenko (you are more than welcome to their concert on Sunday, October 23, 1 p.m., at the Boston Athenaeum – you are the guests of the Educational Bridge Project, so don’t worry about the tickets – it is on us! ), soprano Maria Lyudko and clarinetist Georges Devdariani whose concert will take place at on Sunday, October 30, at 1:45 p.m., at Lowell House, Harvard, right after the Russian Bells’ ringing at 1 p.m. – come to the ringing first and stay for the concert! There also will be master-classes and rehearsals by the dean of the Moscow Conservatory, choral conductor Alexander Solovyev, at the New England Conservatory. We also will have our traditional young musicians’ concert where Dean Solovyev’s 11-year-old daughter Maya will participate, along with the students of Sharon Music Academy and other young (and very young) musicians on Friday, November 4, 7 p.m., at the Boston University Castle. Among the performed works will be two by a pair of local 16-year-old composers – String Quartet “nRT” by Andrew Gritsevsky and Trio for Piano, Flute, and Violin, “In Free Time,” by our long-time festival participant (both here and in Russia) David Joseph. Please visit our website [www.educationalbridgeproject.org] close to the beginning of the festival. The whole schedule will be posted and we will tell you exactly what is going on, when, and where. 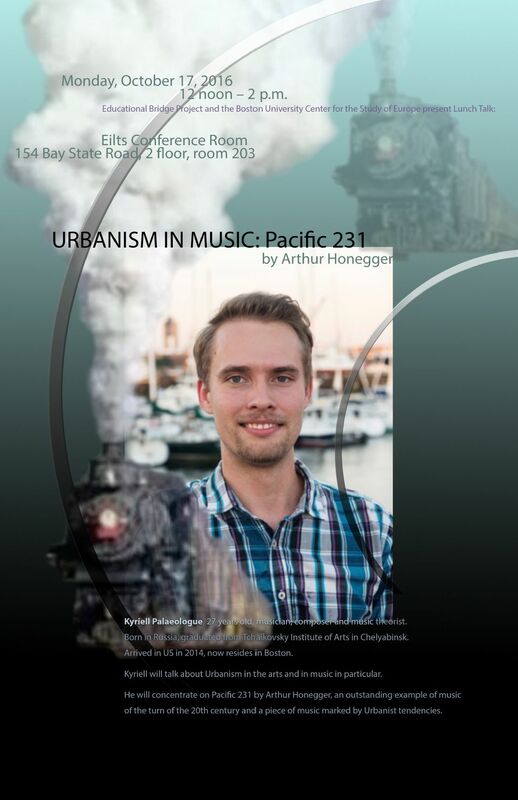 Please also put in your calendar: Monday, October 17, 12 noon, Boston University, Center for the Study of Europe, 154 Bay State Road, 2nd floor, room 203: “Pacific 231” – a very interesting talk on Urbanism in 20th century music, by the young Russian-born musicologist and composer, Kyriell Palaeologue. This talk is part of a lunch series – be hungry for lunch (it will be provided by the Center) and a musical lecture!